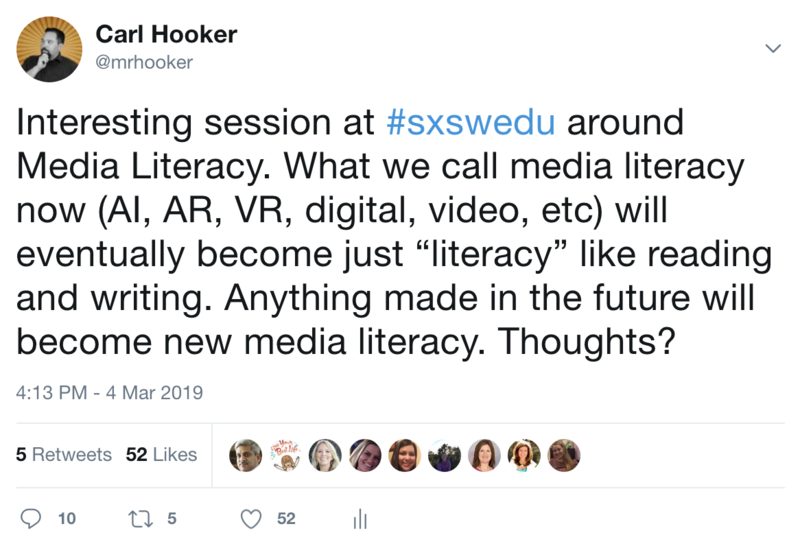 On the first day of #SXSWedu I went to a panel session around media literacy. The panel consisted of educators and representatives from KQED and PBS. During the course of the discussion, one of the panelists mentioned that the term “media literacy” is really built around new forms of media. When becoming literate in film, artificial intelligence, augmented reality, social media, etc, it’s about learning new forms of media. 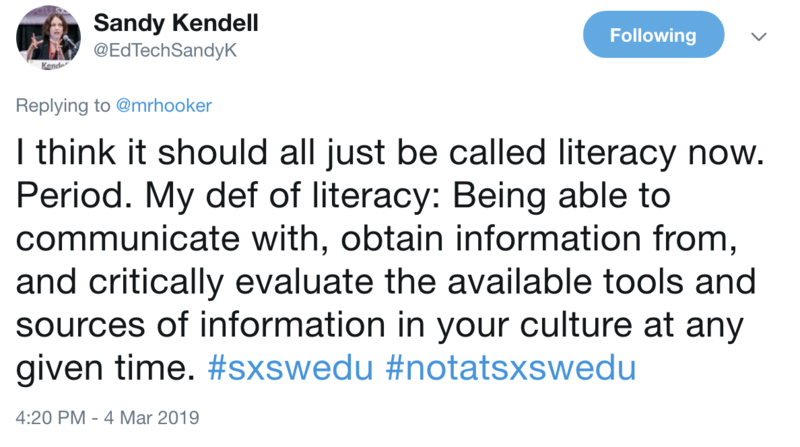 The term “literacy” is still centered around reading and writing. 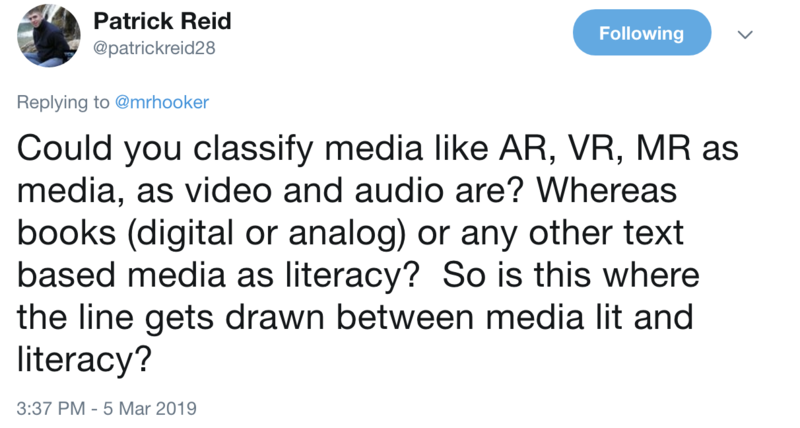 Thus, anything listed as “Media” literacy must be new. In this definition, reading and writing is tied to literacy. However, some of the other definitions like “having knowledge or competence” is an interesting angle that is used with media literacy. Adding the word “media” as stated in the definition would mean you would have knowledge or competence of the media. A different panelist brought up the point that if you have an Alexa or Google Home in your house, that you’ve just included a new form of media (A.I.) to learn and become literate in. That said, many people add these tools without thoughts of learning how to really use or leverage them. They don’t think about the long-term consequences of a tool capturing your verbal data over time. As I wrote about last year, one of my main parenting fails was buying and Echo Dot for each of my kids, so this really hit home with me. That said, I think that banning or turning away all new forms of media is also not productive or a good long-term solution. 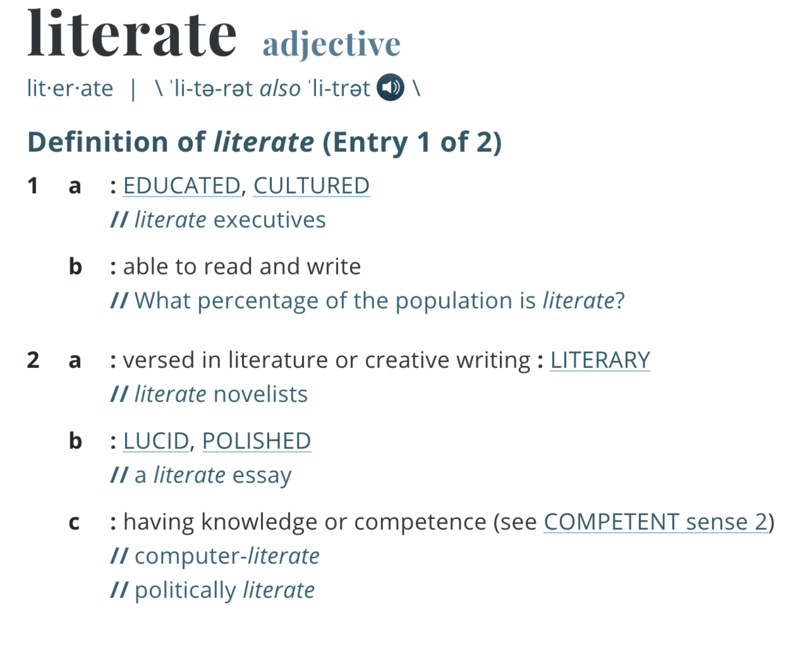 Becoming literate in a tool, as by the definition above, means you understand the downsides as well as the positives to using such a tool. That’s what we need to be teaching kids. All of the above tweets refer to how the term can influence certain thoughts. This is where I really started to have a conundrum. In some ways, the way I was posting and gathering this data on Twitter is considered a form of (social) Media literacy. The idea that reading=consuming media and writing=creating media seems to make the most sense to me. Using those ideas and removing the term “media” would insinuate that the person that has set up an AI home assistant would know how to “consume” it (have it play you music, give you a joke) as well as “create” with it (have it add to a shopping list or program it to flash your lights when a message comes in). 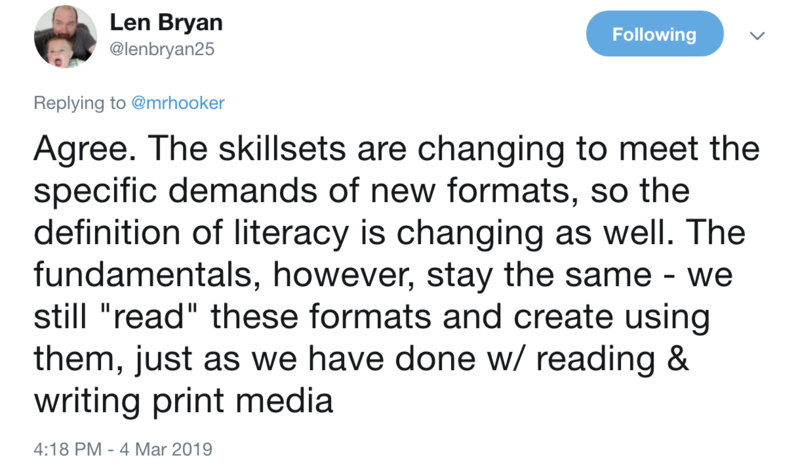 This new form literacy in the AR/VR world looks fairly weighted at the moment to the consumptive side of literacy. We are interacting and consuming virtual worlds or augmented material, but very few are actually creating in this space. My thinking is, as this becomes much more user-friendly through apps like ARMakr or Panoform, we’ll start to create with these tools and become more literate in their use as a result. It’s clear in the future, that students (and adults) will need to interact with multiple forms of media. Becoming literate in those forms of media will not hurt them, it can only help to give them an advantage in the future work place. Knowing that, we would be doing a disservice to the future of our students to not show them how to interact with multiple forms of media. Making them literate, thoughtful, empathetic and impactful members of society is one of the most powerful things we can do as an institution. 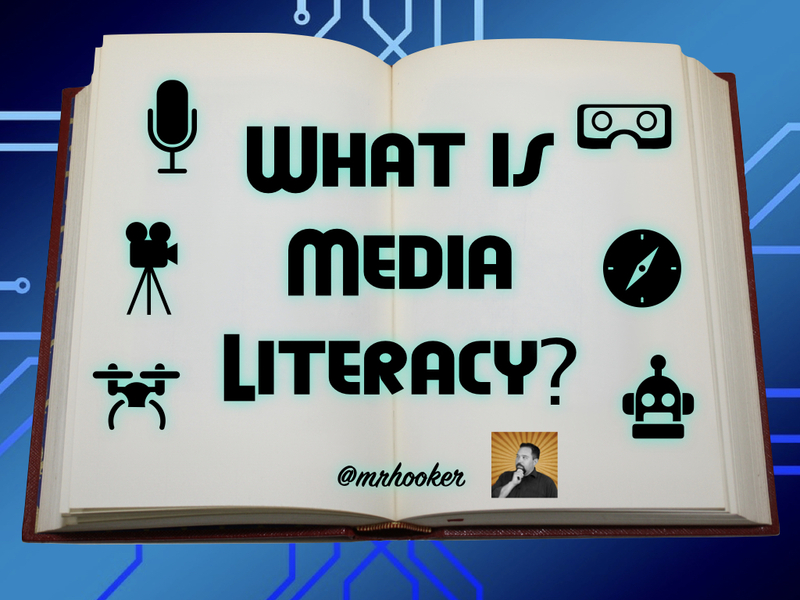 Creating this literacy doesn’t happen without the right tools, teachers, leaders, and mindsets when it comes to using all of this “media” in our world.